Students bought out Pelham Commons' non-perishable food with extra Dining Dollars as part of a food drive. Throughout her freshman year, Student Association Sen. Imani Ross, CCAS-U, said she sometimes did not know if she would be able to eat. “If it wasn’t for the grace of my friends and other peers who had extra dining dollars, some nights I would not eat,” she said. And Ross isn’t alone. Experts said with rising tuition at universities across the country, food insecurity is a growing problem among college students. Last month, Class Council distributed a survey to all students to gauge the need for a food bank on campus. The email cited surveys that found anywhere from 19 to 59 percent of college students deal with food insecurity on campus. “Today, the issue at hand is how the quality of life for some students is affected by the high cost of paying for college,” the email said. Justin Archangel, president of Class Council, said in an email that the group is analyzing the results of the survey and examining the logistics of adding a food bank but did not have any further information to provide. “We’re looking at the results from the survey and logistics of what a food bank could look like at GW,” Archangel said. Ross said that as student leaders and officials weigh the need for a food bank on campus, she planned on working in the SA Senate on the possibility of a food bank. She said she has already talked with other SA senators and intends to begin work on the project in the fall. “Accessibility and affordability was a huge focus in my platform during my campaign, and this issue is something I am definitely going to be addressing with my fellow senators,” she said in an email. 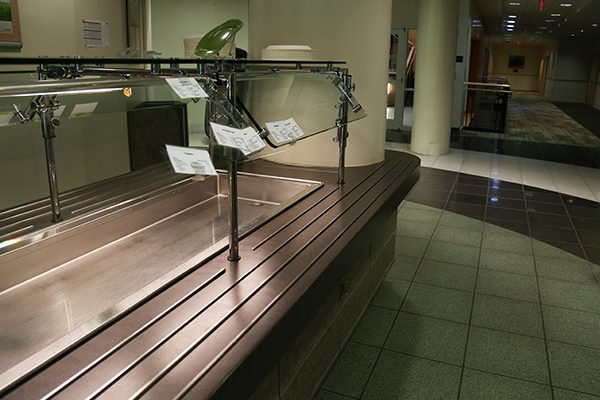 Food insecurity was underscored last week when a food drive designed for students to use their excess dining dollars to buy non-perishable food for D.C.’s homeless left the shelves in Pelham Commons, the dining hall on the Mount Vernon Campus, almost bare. On Facebook, students on budgets or with dietary restrictions voiced concerns that they did not have access to any non-perishable food. University spokesman Kurtis Hiatt said the shelves in the dining hall have since been restocked. More than 200 colleges and universities have already established food banks on their campuses, according to the Wall Street Journal. Of GW’s peer schools, only Duke University has a food pantry for students. Students can take quick meals like soup, macaroni and cheese, and oatmeal from the Student Meal Exchange. Experts said food banks are a good option to give students short term relief from food insecurity. “Either their paycheck is coming due, or they’ve had to pay rent, and they’ve run out of money,” Snelling said about students who use food banks. She said food banks can help for to two or three days a week, but they can’t serve as a primary source of meals. Snelling added that food insecurity can impact students’ academic performance because they need good nutrition to focus in classes. “Students may find themselves in an expensive city and unable to finance the food that they need for nourishment,” she said. Megan Patton-Lopez, a postdoctoral research associate at Oregon State University, who co-authored a study on food insecurity on one college campus, said many food insecure students work more than 20 hours per week and that their GPAs were lower than that of their food-secure peers. “We need to take a look at how education is financed in the U.S., what resources students have access to, and take a holistic approach to understand which policies and programs best support students so that they may be successful,” she said.